Bhairav kunda trekking takes you to the untouched sacred pilgrimage with pristine lakes and beautiful landscapes. Bhairav kunda is located at an altitude of 4,240m, northeast of Kathmandu near to Tibetan border. Bhairv is a name derived from Lord Shiva from his 108 different names. The name of the lake Bhairav Kunda named after the destructive image of Lord Shiva. Each year during the time in full moon day in August, a mass of Hindu and Buddhist devotees visit this place. Beside spiritual journey, this trek offers an excellent mountain views of Rolwaling range, Dorje Lakpa peak (6,966), Madiya (6,257m), Phurbi Ghhyachu (6,637m), Jugal Himal and glorious Tibetan Himalayan ranges. Moreover, you will explore the lifestyle of nomadic people virtually unchanged by time. Best time to discover this trek is on spring and autumn seasons. Furthermore, The trek passes through some beautiful and interesting villages and you might see some of the wild animals such as Musk deer, Himalayan black bear, Monkeys, Himalayan wild goat and particularly birds and wildflowers along the routes. Bhairav Kunda trekking is a tranquil eternity and dotted by the colorful rhododendron forest, which is extremely spectacular in the spring season. 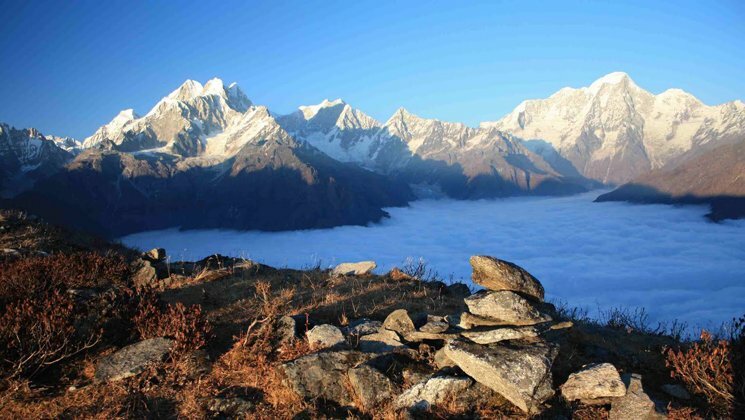 As it is not very difficult trekking, you can trek in any time throughout the year. Why people choose Bhairav kunda trekking? Hike to Bhairav kund starts with the great scenery of Tallest Himalayas beautiful landscapes, Tibetan Buddhism Cultural and Natural heritages. Trek starts from 1000 m low elevation to 5500 meters with relatively short distances at more relaxed pace. The trail does not have accommodation so we need to do as a Tented camping accommodation along the routes. The trek includes all meals, road-head transport, services of English speaking local trekking guide and porters to carry the luggage. You will only need to carry a day-pack and you can walk at your own pace. Discover some of the tallest Mountains and colorful rhododendron forest (Spring), Walking through cultivated fields, colorful Rhododendron, conifers and oak forest, Best view of Himalayan scenery including Dorje Lakpa (6966m), Phurbi Chhyachu (6637m), Madiya (6257m), Experience the Sherpa and Tamang villages and their lifestyles. It is suitable for any walker looking for something a less than challenging which does not require you to have any previous trekking experience. If you are healthy and can walk 5 to 6 hours daily, you can do this trekking. However, daily jogging or walking exercise is useful before you depart. Our program always includes rest days and build up gradually, in order to acclimatize to the altitude. On the trek, you can go at your own pace, with plenty of stops for resting. It is new promoted trek itinerary compared to most walks in this region. The particular route has designed for world explorers who love to explore Bhairav kunda with camping trek. Upon arrival in Kathmandu, Tribhuwan International Airport, we will receive you with private vehicle and transfer to hotel in Kathmandu within B/B plan. Our representative will give you information about Bhairav Kunda trek programs. Day 02: Kathmandu valley world Heritage sites Sightseeing, roughly about 7 hours. Today, we hike to visit Kathmandu world heritage sites with our professional tourist guide Ammar Guni. During the day trip, you can visit Boudhanath Stupa (also known as the oldest stupa of Nepal), Pashupatinath temple (holy temple of Hindu where cremation takes place by the holy river Bagmati), Later we visit Kathmandu Durbar Square (commonly known as Hanuman dhoka durbar square) and Syambhunath Stupa (commonly known as Monkey temples). And transfer to hotel. After having breakfast we drive to Jalbire passing a great view of mountains. We will head to the northeast on the road to Tibet to Balephi, which is once believed to be the trade route to Tibet. Banepali valley is just wonderful than the route becomes little dusty. Then we drive towards Jalbire for about one hour upstream. We will have our first night camp at Jalbire. It is a beautiful newer village situated in the bank of Banepali River where we can refresh ourselves observing Newari culture. We can also visit the temple of lord Bishnu. Stay overnight at Tent camp. After our breakfast, we will head towards Chanaute village. We will pass through some Tamang villages and splendid waterfalls to reach to Chanaute. It is a small village and common home of mostly Brahmin and Chettri. Stay overnight at Tent camp. After breakfast, our next trek will be to Khani Gaun. Chanaute-Khnai Gaun is about 5-6 hours walk. The walk is a little more challenging and steeply. We have to follow the uphill steps. But we can have a great walk throughout the way as we can see the spectacular village and the streams. Khani Gaun is a Newar village and it is believed that during the war between Gorkha and Bhaktapur, natives of Bhaktapur came here to save their life. Stay overnight at Tent camp. We visit Khani village to explore around, meet the local peoples and experience their local life styles. Overnight at tented camp inclusive full board meals. After having breakfast, we will walk uphill steeps through rhododendron forest. It is a great chance to capture the scenery of the rhododendron forest and you can also see beautiful birds and many wild animals. Stay overnight at Tent camp. Trek today is quite difficult as we need to ascend for some hours however as you will have a great view of rhododendron and pine forest, makes your journey more pleasant. Walk some hours to reach Pati (Pati is a small shelter – place for pilgrimage) and from here, you will have an excellent view of Mountains. Stay overnight at Tent camp. Bhairav Kund is a religious valued place. Many people from different parts of Nepal visit this place to take a holy bath mainly during June/July. During the full moon on August it will be best to visit there. The pilgrims also pay their worshiping to the Bhairav (the destructive form of Lord Shiva) in the temple found nearby the lake. Stay overnight at Tent camp. We have to start our trek little early so that we can have the exciting view of the sunrise from Bhairav Kund top. We also can get the sight of shining mountains and mountain ranges namely Langtang, Jugal Himal Range, Rolwalling Range, and the Tibetan Range. Stay overnight at Tent camp. Today is the final day of our trekking. Our journey goes through the back of Bhote Khosi. After reaching Larcha, we can have a hot spring bath if we walk furthermore 30 minutes, there we will have another an have hot spring bath for relaxation. Return to Larcha from hot spring. Stay overnight at Tent camp. Early morning we take a local bus (private vehicle cost an extra) back to Kathmandu city. You can do some last minute shopping of souvenirs for your family and relatives. At evening special Nepali dinner with us. Drop you in Kathmandu International Airport for your onward your final destination and our trip ends. Wish you your wonderful journey. How much does Bhairav kunda trekking cost? The trip price will vary according to group size. For the deluxe and luxury trekking tour plan, we add 3 star category hotel deluxe air-conditioned room in Kathmandu (BB PLAN) and with attached bathroom while on trekking on possible places. AND WE ARE OPEN TO CUSTOMIZE YOUR TOUR AND PACKAGES PRICE AS PER YOUR REQUIREMENTS. International tour leaders are highly encouraged to get discount and attractive complimentary. 2 night’s tourist standard accommodation in Kathmandu within breakfast plan. Kathmandu – Jalbire and from Larche village to Kathmandu transfer by bus. Experienced porters (1 guest : 1 porter basis) because each porter carry maximum 25 kilogram. Any kinds of battery charges, laundry service, phone calls etc. We can organize private Bhairav kunda trekking or Bhairav kunda trek starting at any date that works for you. Please contact us for more information. Question: Do I need the experience to do Bhairav kunda trekking? Answer: No. But if you can walk about 3 hours each day with a lightweight daypack would be easier. Question: What kind of accommodation can I expect on Bhairav Kunda trekking? Answer: We provide you tourist standard accommodation in Kathmandu and you will have Tented camping accommodation along the routes. You need to take your own sleeping bags if you have one with you otherwise, you may rent it while you are in Kathmandu. Answer: This is a fully camping trekking so our professional cook will cook a delicious range of mostly vegetarian such as Pasta, tuna bakes, noodles, potatoes, eggs, dhal bhat, bread, soups, fresh vegetables (variety depends on the season). Question: What opportunities will I have for a shower along Bhairav kunda trekking? Question: How do I get drinking water on express Bhairav kunda trekking? Answer: During the trekking route there are all places hotel and shops where you can able to buy mineral water and you can buy it for drinking but however we advise against buying mineral water in plastic bottles, as currently there are no provisions for disposing of these. Instead, we provide you chlorine tablets to purify the normal water as the normal water is available in campsite/along the way. Question: Is there any communication facilities on express Bhairav kunda trekking? Question: Who will carry my luggage on Bhairav kunda trekking? Answer: We provide porters to transfer your luggage. As we are a responsible trekking tour operator agency, each of our porters carries the maximum of 25 kilos of your backpack which means 2 guests (12.5 kg luggage of each guest): 1 porter basis. However, Ganja la pass trek is challenging trek so each of our porter can carry a maximum of 22 kg of your belongings. If you wish to have a private porter, you might also get it on paying an extra cost.